Introduction: Balance disorders have an estimated prevalence of 85% of the individuals over 65 years of age and are directly related to an incresead chance of falls and its sequels. Objective: To evaluate the corporal stability and the clinical improvement of patients after Vestibular Rehabilitation therapy (VR) according to two different methods: the classical vestibular rehabilitation with global training of the balance system (CVR) and the adaptation of the Vestibular-Ocular Reflex (VOR). Method: 39 patients who were older than 65 years old with body balance disorder and had VR treatment suggested were randomly placed in two groups: Modified Cawthorne and Cooksey protocol (CVR group) and VOR adaptation (VOR group). Patients were evaluated before and after the treatment by the protocol of Stability Limit (SL) of the Computer Dynamic Posturography (CDP), by the Disability Index (DI) and self-evaluation based on reported improvement percentage. Results: 16 individuals of the CVR group and 16 of the VOR group have successfully completed the study. The groups appeared to be homogeneous in terms of age, gender and observed balance changes. After the treatment, both groups presented similar variations of the stability limit parameters, of the used clinical scale and of self-evaluation. Conclusion: Both VR protocols were similar in efficiency in reestablishing the body balance of patients. Complaints about body balance affect 85% of the individuals who are older than 65 years1,2 and are directed related to a higher risk of falls and their sequelae. More than a third of elderly people over 75 are estimated to fall every year3. A precise identification of the causes of unbalance, a medication approach, a proper diet and balance rehabilitation are important issues for this population. These issues aim to minimize the associated morbidity and social welfare costs. The symptomatic approach of balance disorders does not bring any consistent benefit when diseases, typically of this age, persist to stay4. Vestibular involvement is one of the main causes of balance alterations on the elderly. The tendency to falls is straightly related to vertigo, obstacles in the environment, visual involvement, urgency to go to the toilet, cognition involvement, use of medication (sedative or psychoactive), fear of falling, previous history of falls5,6. When elderly people happen to fall, their confidence becomes affected, by making them reduce their social activities7. Vestibular Rehabilitation is a highly effective method to treat the elderly unbalance as well as the prevention of falls. Nowadays, VR is prescribed to patients with alterations on vestibular and central nervous systems, or even to those elderly people who present multisensory involvement8,9. Our results showed 81.8% of effectiveness with elderly patients submitted to Vestibular Rehabilitation by using Cawthorne and Cooksey's method4. The literature affirms that the vestibulo-ocular reflex degeneration is the main consequence of natural aging of the vestibular system10. The classical manifestation of its failure is the unbalance towards body rotation by affecting the act of walking. The intensive training of this reflex, associated to other stimuli, has become efficient to balance recovery and prevention of falls11,12. This study evaluates the clinical benefits and the efficiency of the specific exercises for vestibule-ocular reflex adaptation (VOR) in elderly people who suffer from body unbalance. The study consists of a 60-day blind randomized clinical essay. It was approved by the Ethics Committee (1027/03) and supported by the Auxílio à Pesquisa pela Fundação de Apoio à Pesquisa do Estado de São Paulo - FAPESP (04/09052-4). The sample was composed by 39 patients who were older than 65 years, suffering from body unbalance for more than three months and had been prescribed to VR therapy. They agreed on participating in this study by signing a consent term. The exclusion criteria for not being part of the study were: the use of drugs that acted on balance; motor and/or visual restriction that prevented posturography evaluation and VR exercise performance; no response to caloric stimulation; systemic diseases with no medication control and previous protocols of exercises aiming body balance recovery. Before VR intervention, two clinical evaluations were performed: the Disability Index (DI) 13, whose best score is zero (no presence of dysfunction) and the worst score is 5 (long-term severe disability); and the Visual-Analogue Scale (VAS) in percentage of improvement, where 0% means no improvement of symptoms and 100% means no signs symptoms. The first evaluation was performed at the beginning of therapy (1st day) and the second evaluation at the end of therapy (60th day). In order to evaluate, in quantity terms, the displacement of the center of body mass, the Stability Limit (SL) by Equitest®, NeuroCom Inc. was performed. Each patient was submitted to SL in three stages: 30 days before beginning treatment (pre), on the first day of study (1st day) and after VR therapy being accomplished (60th day). Five parameters of the SL were used to perform the statistical analysis: Latency of the beginning of the movement (ML), Speed to perform movement (MS), larger displacement of the center of body mass at the first movement (Final point of the excursion - FPE), larger displacement obtained along the evaluation (maximum excursion - ME) and directional control of the movement (MD). The therapist, who was responsible for the orientation and exercise follow-up, divided patients into two groups. This division was done with no previous knowledge of the researcher who performed clinical and posturography evaluations. The groups were: CVRG GROUP, which was submitted to Vestibular Rehabilitation according to Cawthorne14 and Cooksey15 twice a day during 60 days; VOR GROUP, which as submitted to adaptation of vestibule-ocular reflex exercises according to Tusa and Herdman16, twice a day during 60 days. Thirty nine (39) patients took part in this study. Nineteen (19) patients belonged to CVRG, and 20 belonged to VORG. Three patients of CVRG and four of RVOG presented discompensation of clinical comorbities during rehabilitation period. The statistical analysis was performed with the 16 remaining patients of each group who fulfilled the protocol. Both groups presented equivalence regarding age (p=0.701), gender (p=1.000), number of comorbities (p=0.311) and DI (p=0.238). There was no difference between the quantity parameter of the basal SL in both groups: ML (p=0.432), MS (p=0.751), FPE (p=0.822), ME (p=0.424) and MD (p=0.165). When the Disability Index (DI) was evaluated, a significant statistical reduction of the scores of the DI after rehabilitation was observed. The observed reduction in CVRG was 1.9 ± 0,8 (min: 0; max: 3; median: 2,0), and in VORG was 1.8 ± 0.9 (min: 0; max: 3; median: 2) (p=0.956). Results are displayed in Chart 1. Chart 1: Box-plot of the obtained scores in the basal Disability Index and after treatment in both groups. - CVR group: Classical vestibular rehabilitation group; VOR group: Vestibular-Ocular Reflex group. The Visual Analogue Scale presented an improvement on all patients of the CVRG (100%) after treatment; twelve of these (75%) improved over 60% and one patient (6.3%) reported no more symptoms. In the VORG, two patients (12.5%) remained with unaltered clinical condition. Among the 14 patients (87.5%) who presented improvement, 13 of them (81.2%) improved over 60% and two of these (12.5%) reported no more symptoms. No clinical aggravation was reported (p = 0.283). The Stability Limit Analysis showed improvement in all parameters of the CVRG: movement latency (ML) (p=0.276); movement speed (MS) (0.221); final point of excursion (FPE) (0.216); maximum excursion (ME) (p=0.146) and movement direction (MD) (p=0.096), and this latter presented tendency to statistical significance. The VORG presented improvement on ML (p=0.224) and on FPE (p=0.116), improvement with tendency to statistical significance on MD (p=0.099), improvement with statistical significance on ME (p=0.022) and worsening on MS (p=0.843). By comparing both groups, it is noticed that the variation was similar in all SL parameters as displayed in Table 1. The approved protocols for Vestibular Rehabilitation of elderly patients consist of global stimulation of the balance which is based on exercises of substitution, adaptation and habituation. These exercises are based on the physiopathology of unbalance that affects the elderly caused by the aging process of the sensory systems and muscle-skeletal efectors17. However, these alterations begin by the aging process of the vestibular system, whose main consequence is the vestibulo-ocular reflex degeneration (VOR) 10, 18, which leads to the unbalance towards body rotation and a deviation on the walking act. The intensive training of this reflex, together with other stimuli, have been presenting efficiency for both balance recovery and fall prevention11,12. 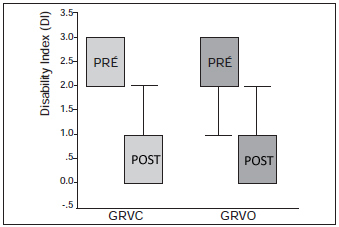 Based on all this information, this study verifies whether the use of specific exercises for the VOR adaptation would bring the same efficiency observed on long protocols of global stimulation, which is effective in this age. The advantage of using specific exercises of VOR adaptation is the easiness for orientation and training, besides the therapy guidance to the reflex that is involved in the vestibular aging process. The exercises of VOR adaptation were described to accelerate the compensations of vestibular injuries that result in the asymmetry of vestibular information, both in the acute stage of injuries and in chronic patients, whose central compensation had not been achieved19, 20. Nevertheless, the literature does not describe its specific use to treat chronic unbalance on the elderly or to prevent falls. It is likely that this proposal has not been considered due to the unbalance physiopathology that typically affects the elderly, by reflecting global alterations (multisensory or muscle-skeletal). When analyzing the Disability Index scale (DI), we observed that both groups presented intermediate scores of the disease impact (CVR average: 2.6 and VOR average: 2.3), which means that our sample was composed of individuals with light or moderate inability to usual tasks, but whose symptoms interfered on outdoor activities. Although the disease carries its impacts, the symptoms of our sample correspond to more frequent cases of elderly people with body balance alteration. After therapy, the clinical improvement of both groups was almost equal by the DI (p=0.956) and by the visual-analogue scale (p=0.283). These results confirm that the subjective impact of the two protocols was similar, when referring the clinical improvement of balance. In order to achieve more reliability on the quantity findings from the posturography exam, patients underwent tests twice before the beginning of therapy intervention, before previous evaluation and on the first day of the study. This previous evaluation, which was performed 30 days before the beginning of the protocol, had the purpose to observe the test acquaintance by patients, by using it as their own clinical control. Such an acquaintance did not happen, suggesting that the improvement that was achieved at the end of the intervention cannot be referred to this acquaintance, but to Vestibular Rehabilitation. The Stability Limit findings are interesting because they reveal important data regarding variations on the displacement of the center of body mass on elderly patients. Movement Latency (ML) is the first parameter to be evaluated. It means the period between the signal indicating the test beginning and the beginning of the displacement of the center of body mass (CBM). This latency rises by the aging process, due to the progressive delay in codifying the command to start movement, besides the delay on the central processing to develop the beginning of the movement. The increase of latencies is related to the risk of falls21,22. These latencies are also related to the cognitive aspects of the neural responses, thus it is necessary to recognize the stimulus and generate a suitable motor response. In the elderly, the tests that evaluate the response latency for the posture control and movement beginning show its relation with patient's cognitive condition and attention23,24. The studied group presented normal latencies, regarding age, on the responses to movement command, which shows a preserved and suitable cognitive condition. After VR exercises, both groups presented a slight reduction on latencies, suggesting that balance confidence, greater body stability and optimized posture adjustments reduced the response time to the stimulus. This observation directly implies less fall, regardless the chosen protocol, either the VOR adaptation or the global one. The second parameter to be evaluated is the average movement speed (MS), with which the displacement of the CBM is performed. The proper control of the movement speed depends on the harmonious integration of posture reflexes and the strategies of movement. Concerning this parameter, both groups presented different variations: CVRG increased speed while VORG reduced it, but there was no statistical significance. We found no justification for such a difference, but believed that the sample enlargement will equalize it. The third and fourth parameters are the final point of excursion (FPE) and maximum excursion (ME); the FPE is the most distant point achieved by the displacement on the first movement supported by the CBM, and the ME is the larger extension of the displacement of the CBM achieved by patient. The FPE and the ME reflect the area of stability body on the four cardinal directions around the body in standing position. 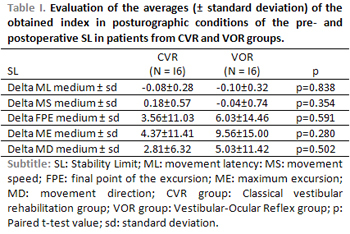 Patients also presented normal condition in its limit regarding age, and after VR, both groups improved their scores in similar ways, by enlarging their body stability limits (Table 1). These results reflect the same efficiency of the two protocols used on the limit enlargement of body stability on the elderly. The directional control (MD) is the fifth parameter. It characterizes the accuracy and harmony of body movement performance. The directional control is the finest parameter of the test. Its accomplishment depends on the accurate integration of all sensory afferences, besides the cerebellar adjustment that coordinates contractions and flexions in proper limit in order to keep the body and head on the same movement line. Patients present directional control in normal condition before therapy and they improve after it with a tendency to a significance in both CVRG (p=0.096) and VORG (p=0.099). Once again, we observed that there is an improvement of sensory integration and its control, regardless the protocol used. The literature describes a hierarchy on the used strategies to posture adjustment. In fixed supporting bases, as the case of the Stability Limit, the variation of the center of body mass depends on the ankle strategies, which allows a +/- 80 anterior displacement and a +/- 40 posterior displacement; and the hip strategies, which will necessarily required if the CBM surpasses the referred limits and feet remain immovable25,26. In order to enlarge the displacement area over the limits comprised by the hip strategies, the footstep is used, and also the support of the upper members as an additional alternative. However, under sudden shock or instable surfaces, the footstep can be the main strategy, especially for the elderly27,28. When studying posture adjustment, Runge et al.29 verified the role of the vestibular system on rapid responses and also observed that vestibular therapists make use of the footstep strategy, mainly in rapid oscillations of the supporting surfaces. The elderly often chose several footsteps to correct body oscillation instead of using hip strategy. The vestibular system plays an important role for both hip and footstep strategies, but selecting one of them is done centrally26,29. Results show a positive impact on the selection of strategies and rapidness of response by the interference of training through Vestibular Rehabilitation. These alterations imply directly on body instability and on fall prevention. Our results allow us to suppose that a protocol of adaptation exercise, focused on VOR and its repercussion on head position, improves the global perception of the balance. We believe that the head and body alignment is an important factor to expand the limits of body stability. The two protocols were equally efficient, which suggests that the exclusive activity of the vestibular system produces the fundamental effects of the CBM stabilization. Based on these findings, we are able to see the importance of VOR on posture maintenance and on displacement and not only on angular and speed movement. The easiness on performing VOR exercises is another favorable aspect when training the elderly, who may present difficulties in understanding the exercises. Understanding the disease and the need of performing the exercises correctly is fundamental for the improvement of these patients. The balance system comprises structures of the limbic system and of the frontal cortex, which provide the complex learning based on the posture experience and motor responses. These centers are important to posture adaptation and development, however, they contribute to behavior that are badly adapted such as anxiety, fear, phobias and privation7,30. Understanding the disease and its manifestations may favor neural plasticity that is involved with balance compensation, which better justifies the responses on the parameters of the used test involving cognition. We conclude that there was a similar effectiveness on the exercises of vestibular adaptation (VOR) and the classical vestibular rehabilitation with global training of the balance system on the parameter of the body stability limits and on the clinical improvement of the elderly who participated in this experiment. 1. MD Doctor of Medicine (Collaborator Doctor of the Otoneurology department of the HCFMUSP. 2. MD Doctor of Medicine (Assistant doctor of the Otoneurology department of the HCFMUSP. 3. MS Master of Science (Collaborator Phonoaugiologist of the Vestibular Rehabilitation ambulatory of the HCFMUSP. This article was submitted to SGP (Sistema de Gestão de Publicações) of R@IO on November 14th, 2007 and approved on February 2nd, 2008 at 10:36:27.